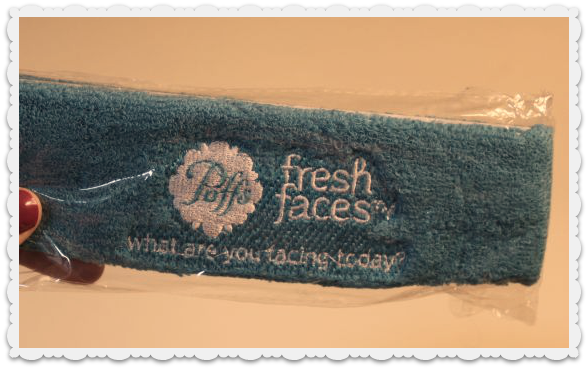 Beautiful Incentives: PUFFS Fresh Faces. Are you getting fresh with me? PUFFS Fresh Faces. Are you getting fresh with me? Ah, Fall has finally approached and the Florida weather is slowly cooling down. I do mean SLOWLY. Of course, the germs are just as rampant and fast traveling as any other state, which is why I came down with some kind of bug these past few days. It was horrible, but I was SO so happy to have Puffs to make things easier. They couldn't have come at a better time when the last thing I wanted to do is wash my face. I could barely move from my bed. I was sent a variety of their their new PUFFS fresh faces Saline face wipes and a bunch of very useful goodies for review. I love the bag that says "Are you getting fresh with me?" I'm a big pun fan. The terry headband is also awesome to keep my hair out of my face when washing it and doing makeup. I love the design of the boxes, very pretty and simple. They are also very user friendly. Just pull back the snap cap and grab one. Then close it back. It holds very well, so you don't have to worry about them drying out! Also, I love that the box is cardboard and easily recyclable! These wipes cleaned my face and even my eye makeup off within a few easy swipes and one wipe goes a long way. Not only do they clean my face well, but I can kill two birds with one stone blowing my nose. They are really soft and non irritating. Great for adults and even children. Definitely great for those with sensitive skin like me! Gross picture coming up, but needed! 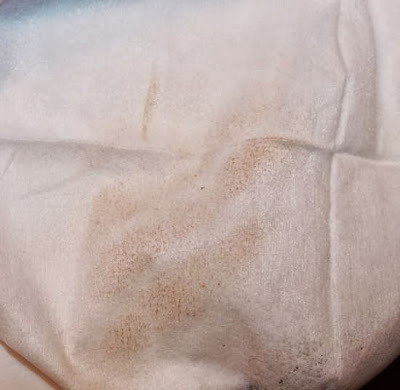 This is how much gunk comes off with one swipe! Light lavender- Refreshing and cool scent. Fresh- Just a very refreshing clean scent. My favorite scent would have to be the Lavender. It is so cool and refreshing and it was a treat when I had a migraine from hell. I would wipe my face and then swipe it across my forehead a few times. It had a nice slightly cool feeling. 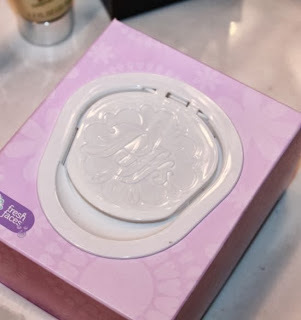 I also used it to gently massage my temples with my fingers over the wipes. This helped a little to get my mind off the horrendous pain and soothed me. 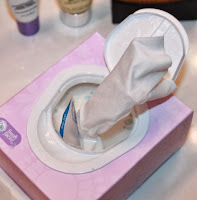 Over all, I love these wipes and I love that they are so gentle. They also didn't break me out, which is a huge plus. I will definitely be repurchasing these. If you are looking for a gentler way to blow your nose and wash your face, you will be pleasantly surprised by these PUFFS! I am now officially a PUFFS blogger and excited to see what's next to show you!